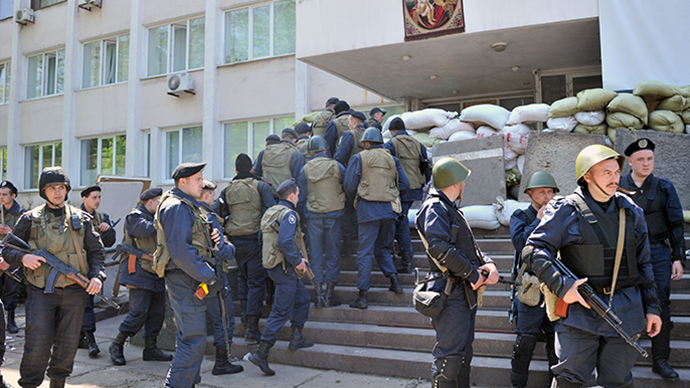 Armed Ukrainian men have surrounded Mariupol City Council building. Reports suggest they were deployed to dismantle barricades, but as anti-Kiev activists tried to negotiate, the armed men opened fire. In footage from the scene, a group of armed men is seen guarding barricades and the building, freed of protesters. They shoot in the air from time to time. As a man approaches them and tries to speak, a military-clad man aims his weapon at the ground and starts shooting, close to the protester’s feet. “The man tried to prevent them from dismantling barricades, military started shooting. First two shot were in the air, the third – in his foot,” local “0629” news website reported. It said the man was taken to a hospital. A crowd of locals gathered outside the building as, they said they heard the shooting. 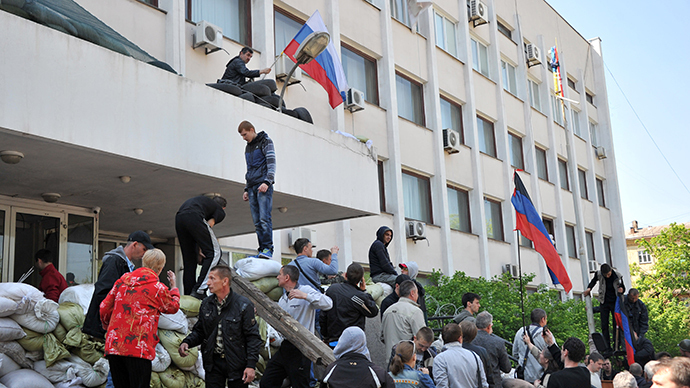 According to media estimates, by 14:00 local time nearly 200 people came to the city council. They chanted anti-government slogans and shouted at police accusing them of letting armed men freely shoot in the city. 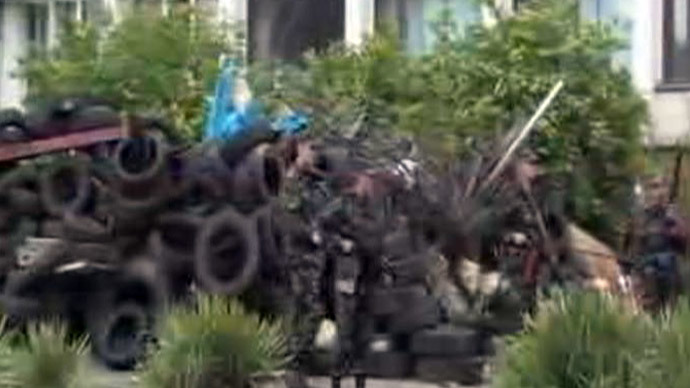 Some of the protesters set a row of tires ablaze. Black smoke was seen billowing over the building. The fire was shortly put out by the fire brigade. At around 15:00 local time, the armed men left. According to a local man who spoke to RT, they “left on two or three” buses. “It all finished as they left,” he said. “When they left, people started putting barricades back together,” he added. Local Mariupolnews website suggested the armed men, supposedly from the National Guard, were deployed to dismantle barricades that protesters left after the Interior Troops seized the building. In the past two days, there has been fighting between anti-Kiev protesters and the country’s armed forces, who in turns were taking control over the city council. There were reports that on May, 7 interior troops used toxic gas as they stormed the administration building. However, in the afternoon of that same day, anti-Kiev activists managed to retake the building and raise the flag of the People’s Republic of Donetsk. Kiev has been conducting a new stage of the military operation against autonomy supporters in the country’s south-east starting May, 2. Russian President Vladimir Putin urged Kive to stop the military operation in the southeast of the country. But the latter opted to ignore the call.